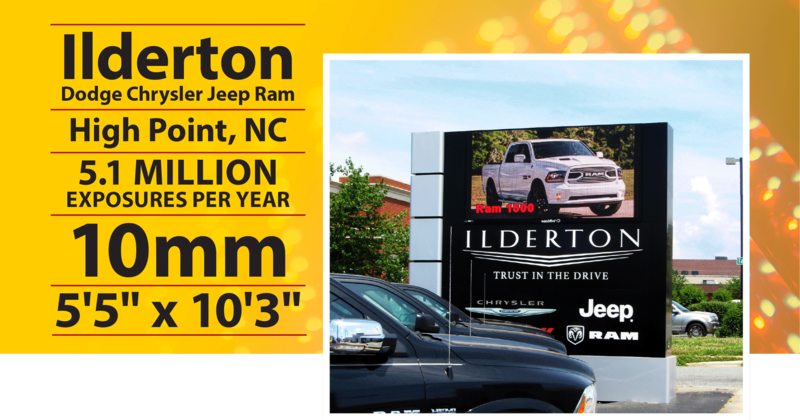 Project Stories - Ilderton Dodge Chrysler Jeep Ram, High Point NC | Atlantic Sign Media, Inc. Located on both sides of a well-traveled road in the heart of High Point, Ilderton had a six-foot tall monument sign required by Chrysler, which often was dwarfed by trucks and SUVs parked near it. With more than 700 feet of road frontage, vice president Steve Ilderton was looking for a larger sign that would make a statement while giving the dealership the ability to advertise promotions happening inside the showroom. That person was Joe Rickman, owner of Atlantic Sign Media in Burlington, NC. Like Ilderton, Atlantic Sign Media is a family-owned business with deep roots in the area. 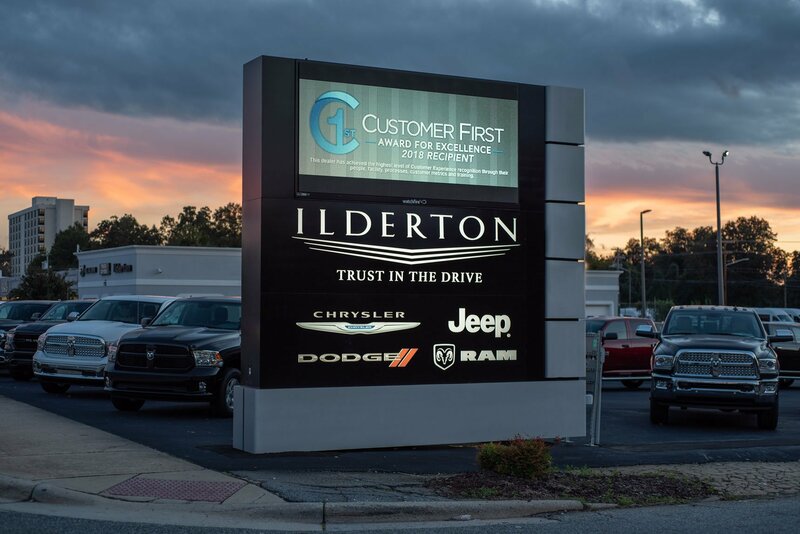 Rickman’s team designed a large, double-sided monument sign that showcases all the Ilderton auto brands and includes back-to-back, high resolution digital displays from Watchfire Signs. Rickman also worked with Ilderton and the city of High Point throughout the permitting process. The dealership uses the digital message center to showcase various car models, and feature manufacturer rebates and sales. Managers can highlight employee birthdays and accomplishments on the displays, and advertise various community sponsorship and events that the dealership supports. This article was originally written as a case study by Watchfire Signs.